In the last episode, the unit tackled a case that circled around the racial tension that is going on in the United States today. A woman goes missing in the ghetto and it’s because her boyfriend was trying to buy drugs. The man who took her wanted to make a point and I think it’s obvious that the point got made. This week’s episode, titled ‘Made a Wrong Turn’, a white woman is kidnapped and held hostage in a black ghetto and the unit has to try and figure out a way of getting her out without citing a war. The show has done these kinds of shows before where they talk about racial tension, but considering what is going on in the world today, it’s a topic that is going to be covered again because people don’t seem to get how deep it goes. In this week’s episode, titled ‘All Cylinders Firing’, the unit comes together to try and find the man who assaulted one of their own, Platt. It’s obvious that we know who the man is behind the attack. It’s the jerk, Focal, who got mad at her for grabbing Tay from him. He doesn’t like that someone went above his head because he was trying to teach her a lesson. How dare she say no to him, I mean really it makes sense. If you know Voight, and you do if you’ve seen the last three seasons, you know you don’t mess with one of his own. He’s going to find the man that attacked her and Focal and knock them down a whole lot of notches and introduced them to the corner of Pay and Back. 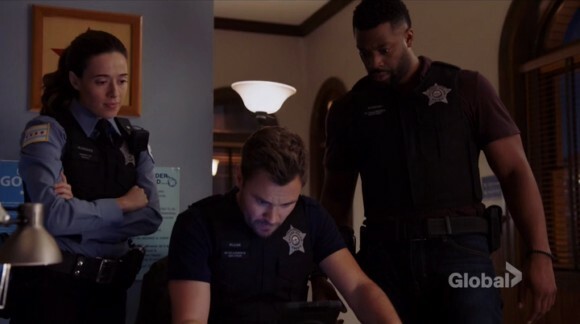 Ruzek, Atwater, and Burgess team up to try and follow Platt’s timeline while Olinksy and Dawson canvass the area. Olinsky finds a camera in the nearby utility pole and wonders if that was how they found Platt. When they go to see her father, they find him shot to death after being tortured to try and get Platt’s whereabouts. While I think its Focal, it looks like the unit is looking at her father’s girlfriends, Natalie’s ex-boyfriend, Leonard. He has a laundry list of charges against him. It seems like a bit of a stretch but stranger things could happen. With them under arrest they begin questioning them. Looks like, Platt was right not to trust Natalie because her and Leonard were trying to con her father but they weren’t the ones responsible for hurting her and her father. They find the getaway car and try and find the man who owns it, Wade. Turns out that Platt ran across him during a drug bust. Platt decides to take matters into her own hands as she runs away from the hospital to try and find the man who did this to her. While she pretended like she didn’t have any intel for them, we all know that she did. She just wanted to handle it herself. It will be a race to who can get to him first….or at least before she can kill him. With 20 years of friendship, Voight finds Platt and tries to talk her down. They have an understanding and a strong bond that helps them understand one another. With the fact that this time Platt wasn’t targeted for taking Tay, that means Focal is still out there wanting to get his revenge. What is he going to do? How is he going to get back at them? When will he try and get his revenge? In the next episode, there is someone going around killing a people and no one wants to help the police try and stop them.